For the past few years, the Wu-Tang Clan has been recording an album in secret. 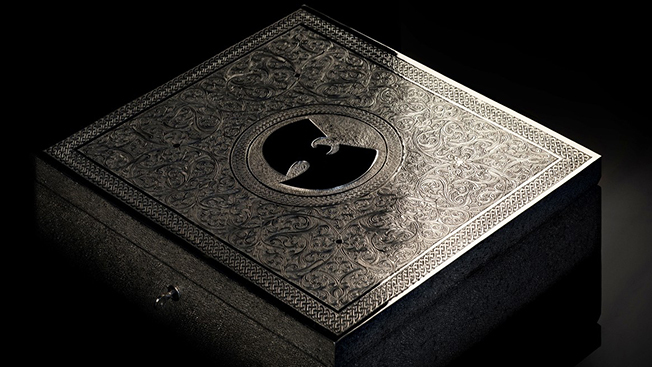 Now, in a first for modern music, they plan to sell only one copy of The Wu—Once Upon a Time in Shaolin. It will be sold in an engraved silver and nickel box handcrafted by British-Moroccan artist Yahya, whose previous work has been commissioned by royal families. But before the band sells this ultimate collector's item for millions, the album will be taken on a grand tour where, for a price of about $50, the average pleb could attend a listening session of the 150-minute album—after undergoing an extensive check for audio recording devices. More than a simple publicity stunt, it is a scream into the darkness of the marketplace for music to be respected as valuable, limited-edition art and yet another attempt, however extreme, in the decades-long search for a disruptive new recording industry business model. Wu-Tang's unique attempt to stop the backslide in album revenues was announced last week as the music industry was collectively rejoicing over the first rise in sales since 1999. Since the rise was largely seen as the outcome of the music industry finally embracing digital distribution solutions, it will be interesting to see the success, or lack thereof, of the Wu's attempt to bring music's business model back to the actual dark ages by holding out for one wealthy patron. And hey, if it doesn’t work, the band's 20th anniversary album, A Better Tomorrow, will be out this summer … and available on iTunes.